On the Home page, double-click the Search icon in the Applications pane. 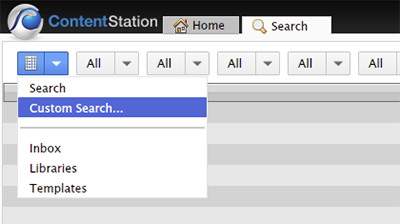 Figure: The Search icon in the Applications pane on the Home page of Content Station. The default search method of the Search Application is to search by Brand and object type. Step 1. In the Search bar, make a choice from the Brand, Issue, Category and/or Workflow Status list or leave them set to 'All' to search all areas. Figure: Making a choice from the Brand list. Note: Options in the Issue, Category and Workflow Status lists don't become available until you have chosen a specific Brand. The lists containing Issues and Workflow Statuses are hidden by default. To make them visible click the Select Criteria button (the yellow pencil icon) and select the check box for the option that you want to see. Figure: When clicking the pencil icon (A) the Select Criteria window appears (B) in which you can show or hide specific search options. Step 2. From the Object Type list, choose 'All' to look for all types of files or choose a specific type to look for files of that type only. Step 3. In the text box enter a phrase that should be part of the file name, or leave the text box empty to find all files. Entered words must be between 3 and 15 characters long. When more characters are entered, only the first 15 characters are used; when less characters are entered, no result is returned. Note: This limitation does not apply to Chinese, Japanese and Korean. Add a plus (+) sign in front of a word to indicate that a word should be part of the search results. Add a minus (-) sign in front of a word to indicate that a word should not be part of the search results. Place multiple words between double quotation marks (“) to treat is as a single phrase. When a colon (:) is used, the search will go into advanced mode and will accept all input as defined in http://wiki.apache.org/solr/SolrQuerySyntax. Any found files are shown. Troubleshooting: no files appear after clicking Search. No files were found based on the search criteria that you entered. Try broadening your search by choosing 'All' in one or more lists. Files do exist in the system but you do not have sufficient access rights to see them. You entered a search term of less than 3 characters. Certain phrases can be prevented from being included in the search results. When the search results fall under more than one 'facet' (a property of the file), the Facetted Search pane is displayed. It can be used to further filter down the results such as by Brand, Category, Issue, Modified On date, Credit, and more. Example: If 'Category' would be a possible facet and the found files are part of multiple Categories, then the Facetted Search pane will display with Category as a facet, showing each separate Category. However, if in this scenario all files are part of the same Category, it will not be displayed as a facet. Figure: In this example the phrase 'water' has been entered (A). 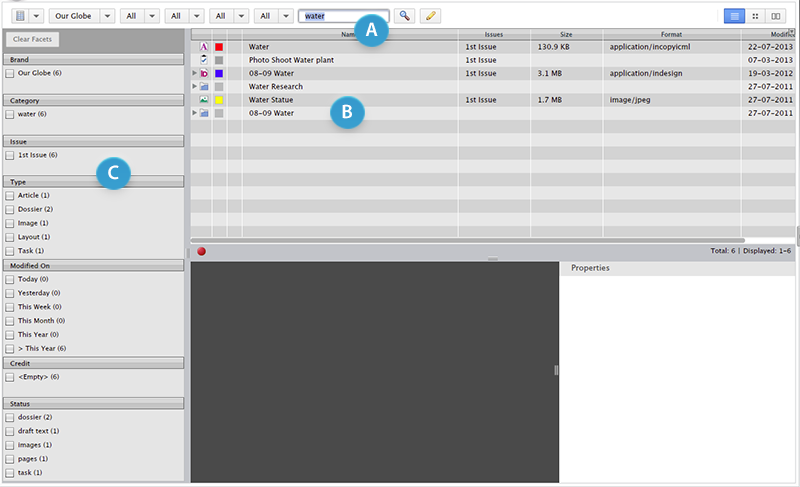 The Search results show 6 files (B) which can be further filtered down by choosing a Facet in the Facet pane (C). Tip: To collapse or expand a group of facets, click its title bar. When selecting a facet, the files in the Document pane are filtered to show only those that match the chosen facet. As a result of the newly displayed files, different facets may be shown by which the search results can be further filtered. No facets are shown. This can occur when Enterprise is set up in a particular way. To resolve this issue, Enterprise needs to be configured. See No facets shown when performing a search Content Station 9. No results are displayed when searching using underscores or dashes. By default, such characters are removed. In order to use these characters in your search. 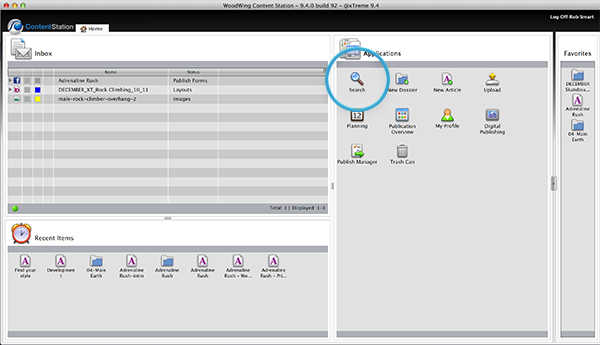 See Configuring Solr to control the search results in Enterprise 9. Unable to sort the columns 'Placed On' and 'Placed On Page'. 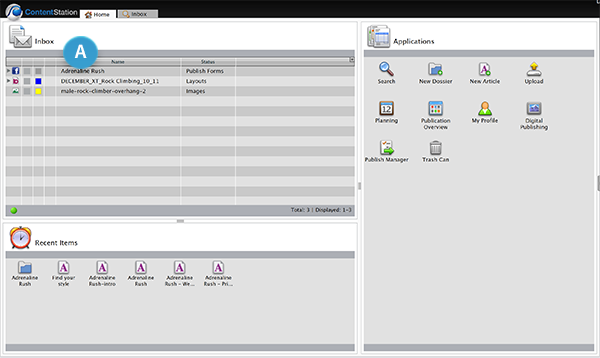 In order to be able to sort these columns, Enterprise needs to be configured. See Enabling sorting on Placed On columns in Enterprise Server 9 with Solr installed. A custom search allows you to store a set of search criteria for those searches that you perform regularly. This way, you don't have to enter these criteria each time you want to run the search. It works by defining the search criteria once, saving them as a custom search and then accessing that custom search from the Search menu of the Search Application whenever you need it. Note: When logging out, all saved custom searches are stored in the Enterprise system. This ensures that when you next log in — even from a different system — the searches are available to you. Step 1. From the Search menu in the Search Application, choose Custom Search... . The Search Criteria dialog box appears. Brand Select one or more Brands. 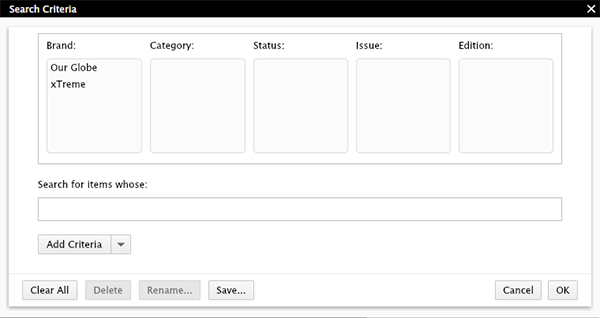 Category, Status, Issue and Edition (Optional, available when a specific Brand has been selected) Select one or more options from each list. Modified On Within Lasts 7 days. 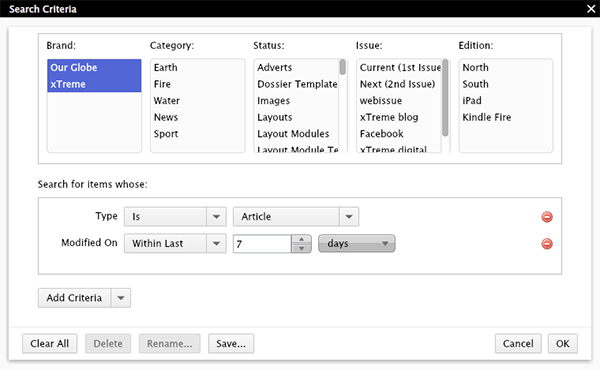 By default, only 3 options are shown in the list: 'Name', 'Type' and 'Content'. For other options to appear, the list needs to be customized. 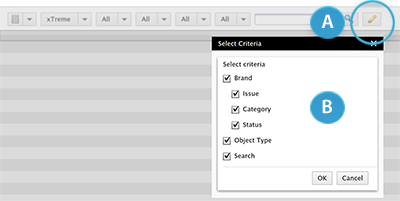 See Customizing the Add Criteria list of a Custom Search in Smart Connection 9 and Content Station 9. When properties of identical types are selected, an OR condition is created. For example: when adding 'Type is Article' as well as 'Type is Layout', this is interpreted as 'Type is Article OR Layout'. When properties of different types are selected, an AND condition is created. For example: when 'Type is Article' is followed by 'Line count is greater than 500' is interpreted as 'Type is article AND line count is greater than 500 lines'. Step 3. Click Save... . The New Search dialog box appears. Step 5. Enter a descriptive name such as Recently used articles and click OK. Step 6. Click OK to close the Search Criteria dialog box. The search is performed and the results are displayed in the Search Application. The custom search is added to the Search menu. Step 1. From the Search menu in the Search Application, choose the custom search that you want to modify or delete. Step 2. In the toolbar, click the Edit button (the yellow pencil icon). The Search Criteria dialog box for the Custom Search appears. Some of the criteria that can be chosen in a custom search deal with a time period such as 'Today', 'Before an entered date and time', and so on. The following table shows the time periods that these criteria cover. Note: The time and date are determined by the server on which Enterprise is installed, not the system on which InDesign is running. This may produce unexpected results, especially when different time zones are involved. Working on a publication is team work and files that you need to work on might be routed to you by other members of the team. Such files are added to your 'Inbox'. Your main view of the Inbox is the one that is shown on the Home page of Content Station. Figure: The Inbox on the Home page shows all files that have been routed to you. The Search Application allows you to search through these files. Step 1. 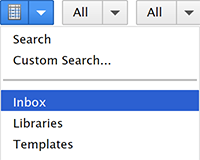 In the Search Application, choose Inbox from the Search menu. Step 2. Enter a search term in the text box. 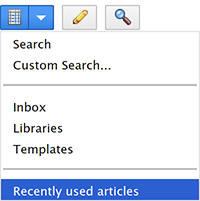 When choosing 'Libraries' from the Search menu, all InDesign Libraries are shown. This option is mainly added for users of Smart Connection and can be ignored when working in Content Station. To see all templates that you have access to, choose Templates from the Search menu. Note: In a typical workflow, you will probably never use this option except when managing templates for other users. Within a Brand, your administrator can assign an Issue as being the 'Current Issue': the Issue that is now up for publication. This could for instance be tomorrow’s newspaper, next month’s magazine, and so on. Similarly, 'Previous Issues' and 'Next Issue' identify the Issue before and after the current Issue. 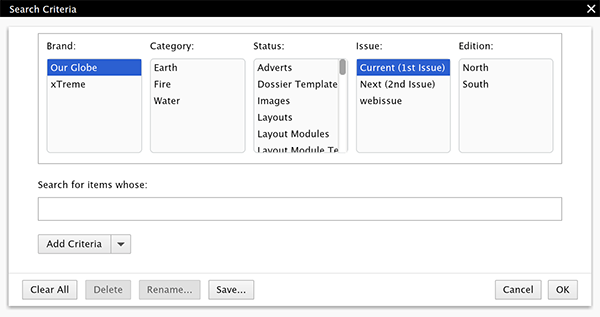 Search by Brand and object type and from the Issue list choose 'Previous Issue', 'Current Issue' or 'Next Issue'. Set up a custom search based on a 'Previous Issue', 'Current Issue' or 'Next Issue'.